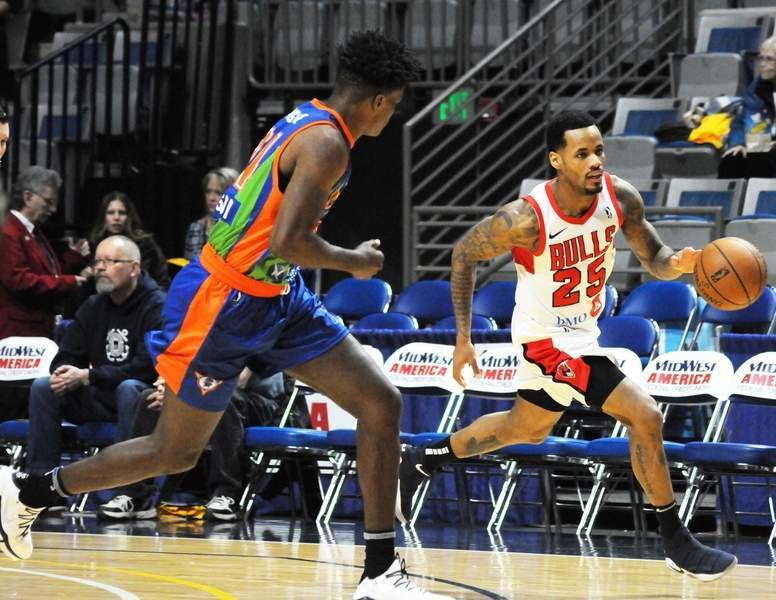 Justin A. Cohn | The Journal Gazette Former Mad Ants star Walt Lemon Jr. hustles the ball up the Memorial Coliseum court Friday night for the Windy City Bulls as he's guarded by Alize Johnson. Will Mad Ants' defense be OK? My concern coming in to tonight was the Mad Ants' defense. Walt Lemon Jr. is very difficult to contain because of that speed and elusiveness we know so well at Memorial Coliseum. And with Tra-Deon Hollins, in my opinion the Mad Ants' best defender, gone, I wondered how the Mad Ants would handle that. Well, it was a mixed bag. In a 116-98 loss to the Windy City Bulls at the Coliseum, Lemon had 15 points, nine assists and eight rebounds. Kaiser Gates had 24 points for the Bulls and JaKarr Sampson had 23. For the Mad Ants, Rob Gray had a team-best 18 points. He's the guy who replaced Hollins in the starting lineup. If you're just catching up, Hollins was waived by the Mad Ants on Wednesday because, according to multiple sources, he failed a drug test. I asked Mad Ants coach Steve Gansey if he's still confident about the defensive capabilities of his team, despite not having the guy who was known as "The Man of Steal," and it was a resounding yes. "We wanted to have a little more length on Walt early on and had Davon (Reed) on him," Gansey said. "Walt played well. He didn't played a lot. ... Rob's a tough defender and Davon's length disrupts things. Steph (Hicks) is tough, too, off ball and even on ball. We like switching, even with Alize (Johnson), so we've got a lot of different options. I mean, there's not necessarily one best guy, it depends on the matchups and who they are guarding." OK, that's a pretty good sales pitch. What he's saying is they don't have a shut-down guard. In fairness, despite Hollins' steal numbers (he was second in the G League), he wasn't necessarily a lock-down defender, but I still think their defense is much weaker today than it was a week ago, but that's my opinion. Also in fairness, we haven't seen enough of some players, namely Ike Nwamu and Je'Lon Hornbeak, to make a full determination. Time will tell on this one. And since the Mad Ants play host to Santa Cruz on Sunday, it's about to get real.